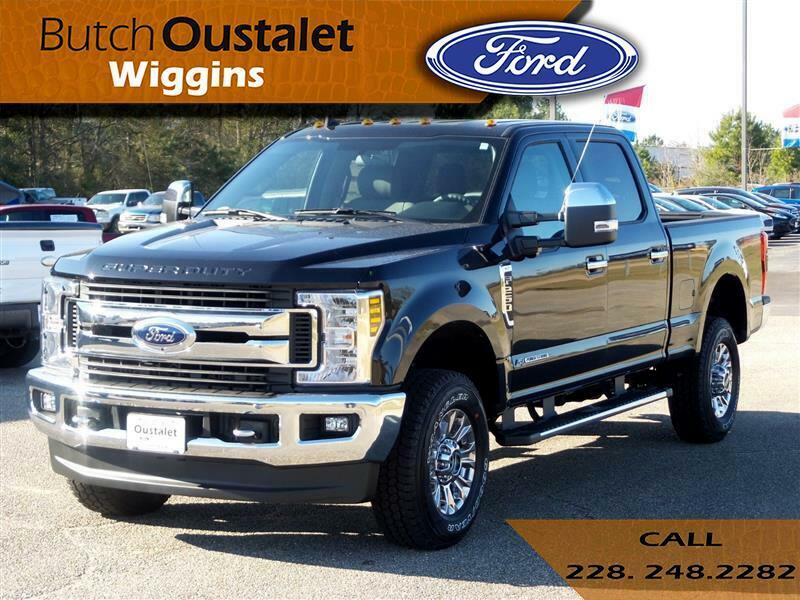 New 2019 Ford F-250 SD XLT for Sale in Wiggins MS 39577 Butch Oustalet INC. The 2019 Ford Super Duty F-250 is what toughness means in big pickups. The Super Duty F-250 has the only high-strength, military-grade, aluminum-alloy body in its class. It’s also more dent-and-ding resistant and not subject to red rust corrosion. This truck comes with standard AdvanceTrac with roll stability control and trailer sway control on both single- and dual-rear-wheel models. Both systems use gyroscopic sensors and apply a combination of reduced engine power and selective wheel braking to help maintain the stability of the vehicle and the trailer in tow. The Super Duty F-250 has a maximum towing capacity of 21,000 lbs. and has an available 27,500-lb. fifth wheel gooseneck hitch for extra power. Plus, it boasts an impressive 7,640-lb. maximum payload. The available trailer reverse guidance enhances visibility via cameras in the sideview mirrors and visual guides in the center dash screen. You get a clear rear view of where the trailer is going, with the guidelines changing with the movements of the steering wheel. The camera view is digitally expanded to show the direction of the truck and the trailer. The Super Duty F-250 rules where high-torque performance means everything when you’re hauling and towing huge loads. The 6.2L gas V8 delivers more heavy work-capable muscle. Need the severe-duty stamina of a durable, powerful diesel? The available Power Stroke Turbo Diesel V8 is ready to join your workforce. While this truck is built to work hard, available technologies such as Blind Spot Information System with Cross-Traffic Alert and Trailer Tow, SYNC 3, up to 7 available cameras, adaptive cruise control, rear seat storage and flat load floor, LED box lighting, remote tailgate release, tailgate step with tailgate assist and FordPass app access help you work smarter and more productively. Program #21010: Not all buyers will qualify for Ford Credit limited-term APR financing. Eligible vehicles will receive "Select Inventory" APR Financing. Vehicle supply is limited. Take new retail delivery from dealer stock by 07/01/2019. See dealer for complete details. (13486) Program #13486: $1,000.00 Ford Credit Bonus cash requires Ford Credit financing. Not all buyers will qualify. Take new retail delivery from dealer stock by 07/01/2019. See dealer for complete details. Truth in Lending Act Disclosure: Down payment will vary with APR and credit. For example, 2.9% APR with $2,500 down payment provides for 36 monthly payments of $29.04 per $1000 financed for qualified buyers. 3.9% APR for a term of 48 months corresponds to a monthly cost of $22.53 per $1000 financed. 4.9% APR for a term of 60 months corresponds to a monthly cost of $18.83 per $1000 financed. 6.9% APR for a term of 72 months corresponds to a monthly cost of $17 per $1000 financed. 7.9% APR for a term of 75 months corresponds to a monthly cost of $16.94 per $1000 financed. The rates described are for estimation purposes only; you may not be able to finance at this rate.